The following OUTFOX Prevention product review of the Cleanpen will help you find a new infection control solution for your organization. It doesn't matter whether your organization is in healthcare (hospitals, clinics, etc. ), education (schools, preschools, universities, etc.) or in another industry, the Cleanpen can help reduce the spread of illness. Hence, your organization can experience a healthier environment by reducing the germs that spread hand to hand, which often happens by pens as a medium. We love the product... what do you think? The Cleanpen is a simple infection control device that cleans pens with sanitizer and a little bit of friction. The simple egg shape design features openings on both ends where a pen can be inserted and retrieved for use. Inside of the Cleanpen design is a sponge soaked in a sanitizing solution that helps clean and wipe germs from your writing utensils (whether it be a pen, pencil, stylus, etc.). The owners even offered to drink the sanitizing solution to demonstrate its non-toxic properties. Please let us know if you would like the MSDS on the sanitizing solution. We will be testing to see how many germs are eliminated- so, stay tuned in the future. The sponge is supposed to last usually about 2-3 weeks, but that all depends on the amount of usage. The Cleanpen is equipped with a swivel that allows for the top portion to be rotated wherever it is placed. The swivel is especially useful because the Cleanpen also comes with a sticky platform. This sticky platform is necessary because it acts as an anchor so the user is able to easily insert and retrieve pens. However, the sticky platform ties the Cleanpen device down to a single area. So, it is important to place your Cleanpen(s) where they will be used most. Placing your Cleanpen in a high traffic area is preferred, but anyone can appreciate a clean pen even on their own desk! 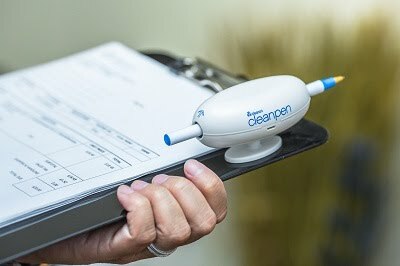 How does the Cleanpen work to reduce bacteria and viruses? The hygiene effects of the Cleanpen can be very broad, depending on the location of the device. Receptionist desks, nurse stations, conference rooms, classrooms, state offices, etc. are only a few of the high traffic areas that Cleanpen can help. I keep one in my office and love knowing that each time a pen is retrieved that it is coming out clean and not dirtying my hands further. The sanitizing solution and friction from the sponge capture the germs in an easy way instead of having to physically wash them off. Ever had someone "borrow" a pen and then out of habit put it in their mouth? Or have you ever borrowed a pen that had chew marks? Ewwww! Germs are spread every day by means of pens and other writing utensils. Cutting down on the germs spread by pens can help you fight infection and get sick less often... now only if there was a way to clean the hands of people that shake your hands often! We use the Cleanpen in our office and love what it does for our customers and staff. We love that it instills confidence in our organization and reinforces that our company feels responsible for keeping a clean environment. We believe that having the Cleanpen system will help improve the perception of your organization to your clients. Besides clients, your employees will have confidence that your organization is responsibly pursuing a healthier workspace. We agree with the Cleanpen phrase "it's simple - it's clean". Perceptions aside, maintaining a clean working environment will save money in the long run as students, teachers, employees, etc. will get sick less often. The costs of sick days and missed assignments has always been an issue for organizations. So, take a step toward reducing them! Try out the Cleanpen now and then get your organization on board (PURCHASE HERE). Thank you for your attention to this product review. For other product reviews, see the Hygiene Blog. Thanks! >>Buy Cleanpen and Refills Here! T-Shirts, Bracelets, Hats, Ties, Mugs, Etc.